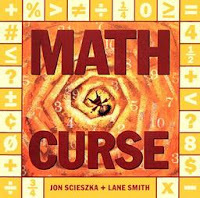 Here are some free lesson plans based on Science Verse and Math Curse by Jon Scieszka. Read Write Think has free printable Math Curse lesson plans. Then for Earth Day, that same site has free printable Science Verse learning activities on earth science. Here are more free printable Math Curse lesson plans from The Teacher's Corner. Ethemes has other free printable lesson plansfrom Math Curse. Global Classroom has free Math Curse learning activities too. Check out this site for free printable Science Verse lesson plans. Here's a packet of free printable Science Verse learning activities. Probably the best lesson plans on both books are to have children write their own math and science verses or learning activities. Use Science Verse as poem templates or poetry frames. Use the learning activities in Math Curse to create your own math story problems.